You are here: Home / COCKTAILS / Hard Apple Bourbon Cocktail, THE holiday cocktail! Hard Apple Bourbon Cocktail, THE holiday cocktail! Looking for the perfect signature cocktail to serve for the holidays? The Hard Apple Bourbon Cocktail answers your call for the perfect drink. 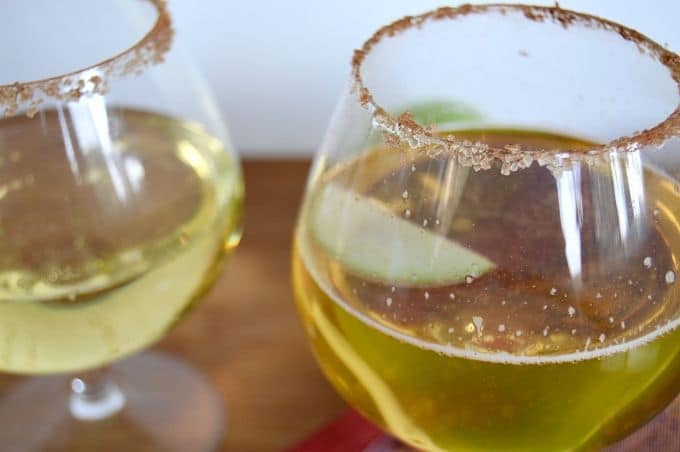 The hints of hard apple cider mixed with a smooth bourbon are a perfect cocktail to sip on before, during or after the holiday dinner. This weeks search for Cocktails was inspired by wanting something special to have besides a really nice wine this Christmas Season. I’d seen so many different hard apple ciders on the market. But alone, they just don’t do it for me. I like the acidity and hints of apple aroma, but I just wanted something a little more than a plain hard apple cider. A perfect mix with it… comes the Hard Apple Bourbon Cocktail! When making a holiday cocktail what is the difference between Scotch, Whiskey and Bourbon? All of these terms are whiskeys. Whiskey is a spirit distilled with a fermented grain mash. The grains can vary between wheat, rye, barley or corn. The distinction from there can be determined by either location or what grains are used in making the whiskey. For a whiskey to be called a Scotch, it must be made in Scotland. Bourbon has very specific rules that must be followed to call it a Bourbon. It must be made in the USA and my made with at least 51% corn mash. Among a few other regulations it must be aged in new oak charred barrels too. If you would like further details in what the differences are I found some great information here on Mens Journal’s website. What Brand of Bourbon or Whiskey to buy to make the Hard Apple Bourbon: Signature Bourbon Cocktail? Woodford Reserve is a lighter tasting whiskey but still has a creamy taste that works well with the cooler weather and having a warming drink. Knob Creek is a very bold taste but has subtle hints of maple and caramel notes that pair well with anything apple. This drink does need to be made one by one. 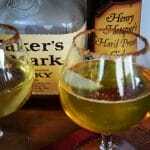 The cider has a slight effervescence and if you make it too far ahead it kind of goes flat. The drink is shaken and then the ice is strained out but it’s delicious when served ice cold! 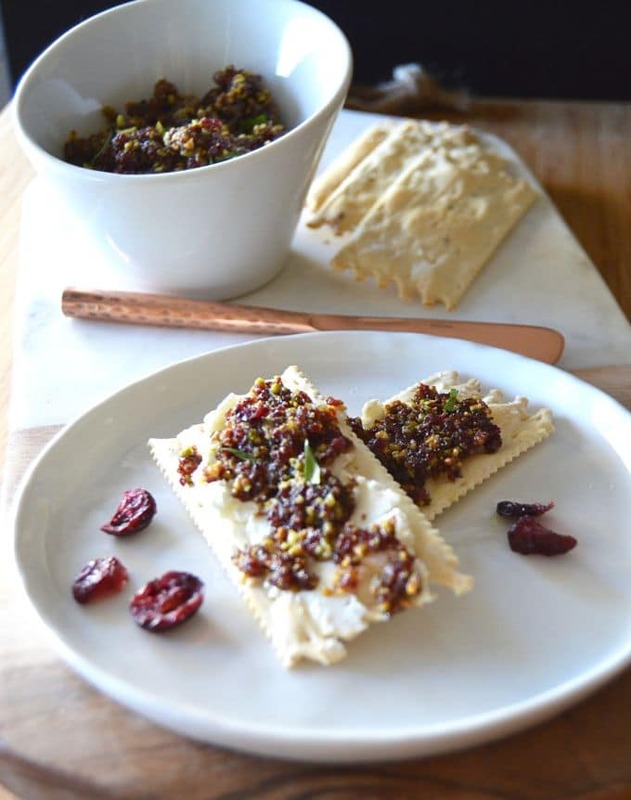 Serve this with the Cranberry Pistachio Spread for an easy appetizer to go with this signature cocktail treat! Craving more recipes for Holiday entertaining sign up for my mailing list here at the bottom of the page. or PIN THIS TO YOUR HOLIDAY COCKTAIL or PARTY Board for when you are looking for ideas to serve at Christmas! Also Follow me on Pinterest to get more ideas to have for making easy delicious meals and appetizers for any entertaining! Looking for the perfect signature cocktail to serve for Thanksgiving? Look no further. The Hard Apple Bourbon Cocktail answers your call for the perfect drink. The hints of hard apple cider mixed with a smooth bourbon are a perfect cocktail to sip on before, during or after the turkey dinner. Place sugar and cinnamon in large saucer and mix well. Cut a lime wedge and rub the rim of your serving glass. Drag edges of glass through cinnamon and sugar coating. Place Cider, Bourbon, honey and ice in a cocktail shaker. Strain cocktail mixture serving glass. Garnish with an apple wedge and serve! Any hard apple cider will work just fine. As well as any bourbon although I highly recommend the Maker's Mark Brand. SOunds exactly my cup of tea, all the right flavours. Good tip to make individually rather than in bulk. This drink is so festive! I’ll have to tuck it away for next Thanksgiving! Oh yes please. I’m in! Stumbled, pinned and yummed! 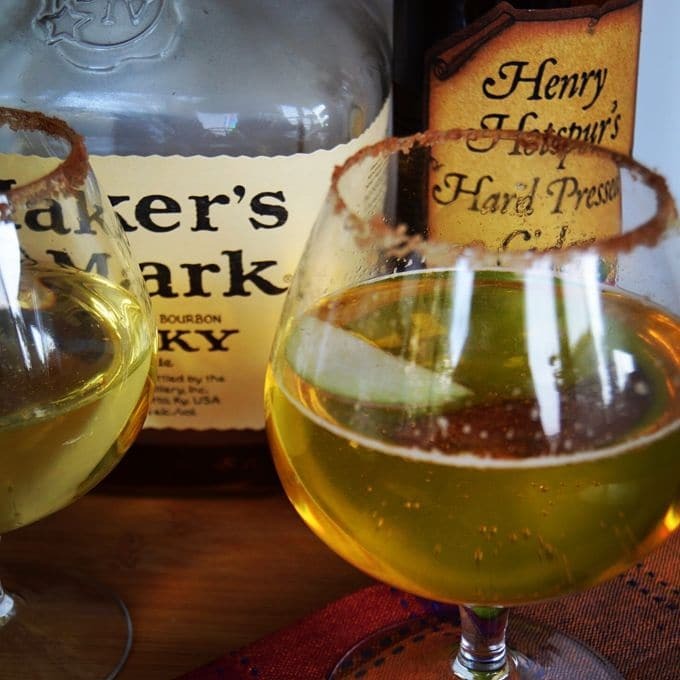 This sounds so good, I bet the cider sweetens the bourbon up perfectly, thanks for sharing! On my first trip to America I couldn’t understand why cider was called hard cider. I had no idea your “normal” cider wasn’t alcoholic at all! It’s funny how we speak the same language but the meaning isn’t always the same. I’m a big fan of English cider, particularly in cocktails so this is right up my street 🙂 thanks for sharing! I’m trying to learn and perfect a few cocktails and this one is TOTALLY going on the list.